Description of "Plant and Soil Volume Six"
Plant and soil volume six describes how nutrition is coming to plants and also to humans from atoms in space How plants don't have excreta as they are in equilibrium with atoms and assimilate as much as needed unlike humans. Crop production can be increased by plant density. Dr Naresh Kumar Gupta was born in Gali nela Wali Bazar Sita Ram Delhi in September 6 1954. 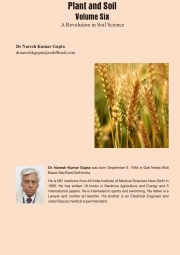 He is MD medicine and has written 38 books in agriculture energy and medicine. Reviews of "Plant and Soil Volume Six"